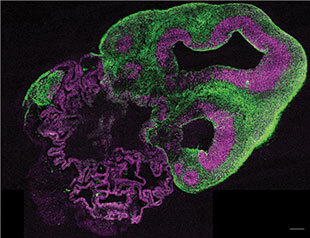 NEURONAL NEXUS: Neural stem cells (magenta) and neurons (green) comprise brain organoids. Lancaster’s group has nurtured organoids/clumps like this one these for up to 15 months.MADELINE LANCASTER/IMBAIn 2009, at the Hubrecht Institute in Utrecht, Netherlands, Hans Clevers and postdoc Toshiro Sato took adult stem cells from the mouse intestine and created the first mini-guts they called organoids—three-dimensional organized clusters of cells that would allow the researchers to glean new insights into the biology of gut health and disease, including colorectal cancer. 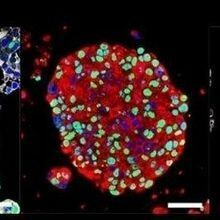 This method inspired many other scientists, working with both mouse and human tissues, to create a rapidly expanding palette of organoids that now includes kidney, brain, liver, prostate, and pancreas. 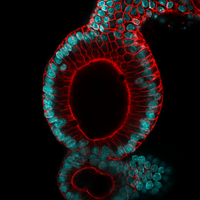 These cultured clumps are tiny enough to be sustained without a blood supply, but large and diverse enough in their cell compositions to tell us something about tissue development and whole-organ physiology. A typical organoid protocol starts with isolated embryonic or pluripotent stem cells. Scientists culture the cells in a proteinaceous matrix (such as Matrigel) that supports three-dimensional growth. After a set period of time the organoids grow mature enough for study, or for engrafting into a mouse to allow them to further develop. Researchers then harvest the organoids and slice them for immunohistochemistry, funnel them through a flow cytometer to study their cell surface markers, or blend them for PCR. The Scientist talked with researchers about how they’re producing organoids, and what beginners should know. Here’s what we learned. Researcher: Madeline Lancaster, group leader, MRC Laboratory of Molecular Biology, Cambridge, U.K.
Background: In 2013, as a postdoctoral researcher in the lab of Jürgen Knoblich at the Institute of Molecular Biotechnology in Vienna, Austria, Lancaster developed organoids from neural stem cells that she had been studying in 2-D culture conditions. She used the method to coax human induced pluripotent stem cells into brain organoids in order to understand the biology of microcephaly, a disorder that is difficult to re-create in animal models (Nature, 501:373-79, 2013). Researchers have adopted Lancaster’s methods to create models of embryonic brain development, analogous to what happens in the first trimester of pregnancy, and to probe the molecular mechanisms of brain disorders, including autism, schizophrenia, and neurodegenerative diseases such as Parkinson’s and Alzheimer’s. Getting started: The group’s protocol addresses some of the common questions asked by new users and provides photos showing the appearance of healthy organoids (Nat Protoc, 9:2329-40, 2014). For those well versed in cell and tissue culture, the time and financial investment required to delve into organoids is minimal, Lancaster says. You need two main things: Matrigel (the supportive structure that allows the organoids to develop into more complex tissue) and equipment that will allow you to agitate the organoids to enhance nutrient and oxygen exchange in the media, making bigger organoids possible. If you don’t have a spinning bioreactor, you can use an orbital shaker set inside a standard tissue culture incubator. Considerations: You should closely characterize the first few batches using RT-PCR or immunofluorescence to check for the expression of certain genes that indicate the organoids are indeed brain cells, Lancaster says. 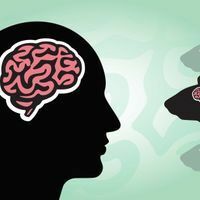 Researchers studying neurodegeneration might consider examining their organoids starting at about four months. Although the organoids survive for up to 15 months, by that time they don’t look healthy. They start to decline at around six or seven months, as the neurons begin to disappear and are replaced by glia. Tip: It takes some time and practice to develop an eye for healthy organoids. A good way to learn is to take pictures of your organoids as they develop. “You can always look back and say, ‘Oh, at that point I think it started going bad,’” Lancaster says. Looking ahead: Lancaster has already tweaked the method to improve the reproducibility, using a combination of timing and media formulations, and some new additives. She expects to publish a revised protocol by the end of the year. Background: The intestinal epithelial layer is made up of tiny, slender projections, called villi, resembling the strands of a shag carpet. The nooks formed at the bases of the villi, known as crypts, are home to intestinal stem cells responsible for constant renewal of the intestinal lining. Building on Sato’s protocol, Mahé added two new twists: he used manual dissection to extract the crypts, rather than shaking the tissue to dissociate the cells; and he added a small-molecule activator of the Wnt3A pathway to boost expansion of the cells (Curr Protoc Mouse Biol, 3:217-40, 2013). 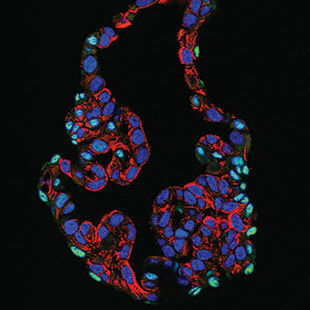 Helmrath’s group grew such “enteroids” from intestinal stem cells isolated from the crypts of surgically removed human intestine. In principle, such organoids could be developed from the tissue of specific patients for diagnostic and clinical uses. A video protocol is available in the Journal of Visualized Experiments (doi: 10.3791/52483, 2015). Tip: Many questions about cell proliferation, migration, and differentiation can be answered using in vitro organoids, Mahé says. “You save time, you save money, you save animals as well.” After that, you might consider moving into an animal model, depending on your goals: for example, to see muscle development, you should work in vivo, Mahé adds. Looking ahead: The group is still working to be able to efficiently engraft human adult intestinal stem cell–derived organoids into mice. Although their first attempts were unsuccessful, they have since generated organoids for research from human embryonic stem cells (ESCs) and human induced pluripotent stem cells (iPSCs) derived by reprogramming fibroblasts. When organoids created from the either type of pluripotent stem cells are engrafted into immunodeficient mice to allow the cells to mature further, they develop into a human intestine (Nat Med, 20:1310-14, 2014), which may eventually lead to bioengineering a custom human intestine. Cost: The Helmrath group spends roughly $150/sample in reagents to culture their organoids for a month. 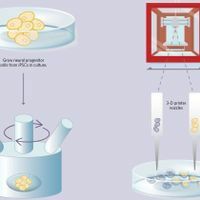 The medical center’s Pluripotent Stem Cell Facility provides training for a fee, and sells human intestinal organoids for roughly $400/plate (which contains 20–30 organoids). Background: When naive B cells in the body are exposed to antigens, they form clumps of cells called germinal centers in a lymph node or the spleen, where they proliferate, mutate to generate high-affinity antibodies, and undergo clonal expansion. Until now, this process has been difficult to recapitulate in vitro. Adding the necessary (stromal) support cells to primary naive B cells and culturing them in 2-D does not enable them to differentiate into cells resembling those from germinal centers, Singh says. Unlike stem cells, naive B cells do not tend to grow in clusters, so they need a little extra help. Rather than using the conventional Matrigel for 3-D culture, Singh and his collaborators developed a gelatin and silicate-nanoparticle mix that mimics the softness of the body’s lymphoid organs. Within four to six days, the B cells in these organoids mature—100 times faster than B cells in 2-D culture—and produce two classes of antibodies important for fighting infections. The scientists use collagenase to dissolve the gel and harvest the organoid’s cells for analysis using flow cytometry. These new germinal center organoids were described this year in Biomaterials (63:24-34). Getting started: Making the gelatin-nanoparticle mix is as easy as making Jell-O at home, Singh says, and the ingredients are commercially available. You’ll need experience with animal dissection (the necessary starting point is isolation of naive B cells from the spleen) and with cell culture. Once these techniques have been mastered, it takes roughly one week to get your first batch of organoids with mature antibody-producing cells. Considerations: Singh’s group has already determined an optimal gelatin-nanoparticle ratio (2% gelatin/1.5% nanoparticle), but if you you’re using genetically mutated B cells, you may need to tweak the ratios. “It can be easily tuned,” Singh says. Tip: After four days of incubating the cells with gel, you will see dark spots—a sign that the cells are proliferating and that you’re on the right track. Cost: Not including the cost of generating immortalized stromal cell lines, it costs roughly $1 to produce one germinal center. Background: In 2009, Shen’s group discovered a rare population of stem cells from which prostate cancer can originate (Nature, 461:495-500, 2009). Calling them CARNS, for castration-resistant Nkx3.1-expressing cells, the group knew they would face challenges culturing the cells because they are a type of luminal epithelial cell, which had historically proven difficult to expand using 2-D methods. “We thought if any type of approach would succeed it would be 3-D,” Shen recalls. Through a trial-and-error approach, postdoctoral researcher Chee Wai Chua eventually converted mouse CARNS into organoids (Nat Cell Biol, 16:951-61, 2014). The resulting cell types and tissue architecture resembled those characteristic of normal prostate epithelium. The researchers then engrafted the organoids into mice to generate prostatic tissues. Considerations: When applied to the prostate, Clevers’s conditions seem to favor the growth of a different type of prostate cell known as a basal cell, though his group also grew luminal cells. Shen’s conditions are less defined than those of Clevers, using serum instead of specific growth factors. Shen’s group doesn’t know exactly which growth factors in the serum drive organoid growth and development. Tip: If you are making the organoids from normal prostate for the first time, you might consider assessing their response to androgen deprivation. They should lose expression of Nkx3.1 in response to this condition. Cost: It costs $1 or less for one mouse prostate organoid (not counting animal, equipment or labor costs).